Kurt Schwitters 1887-1948. German painter, sculptor, typographer and writer. Born in Hanover. Studied at the School of Arts and Crafts in Hanover 1908-9 and at Dresden Academy 1909-14. Influenced by Expressionism and Cubism 1917-18. 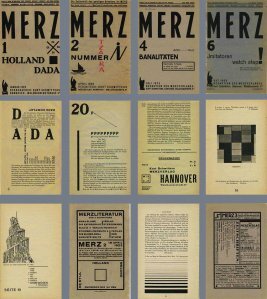 In 1918 created his own form of Dada in Hanover called 'Merz', using rubbish materials such as labels, bus tickets and bits of broken wood in his collages and constructions. Friendship with Arp, Hausmann and van Doesburg. Published the first edition of Anna Blume (a collection of poems and prose pieces) in 1919 and the magazine Merz 1923-32. First one-man exhibition at the Galerie Der Sturm, Berlin, 1920. Began in 1923 to build fantastic Merz constructions in his house in Hanover (the first 'Merzbau'). Spent the summers in Norway from 1931 and emigrated in 1937 to Lysaker near Oslo. Fled to England in 1940, spent seventeen months in internment camps, then lived 1941-5 in London. Moved in 1945 to Ambleside in the Lake District. In the last months of his life, he began a further Merz construction in an old barn at Langdale. Died at Kendal. 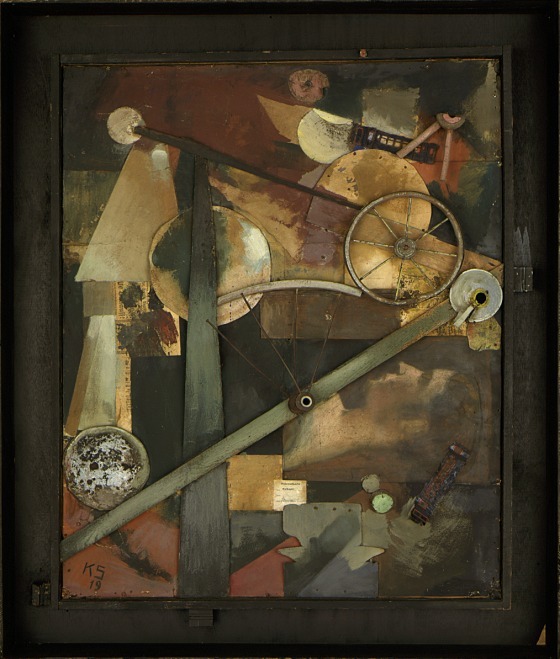 Kurt Schwitters was one of the most engaging mavericks of the art of the 20th century. 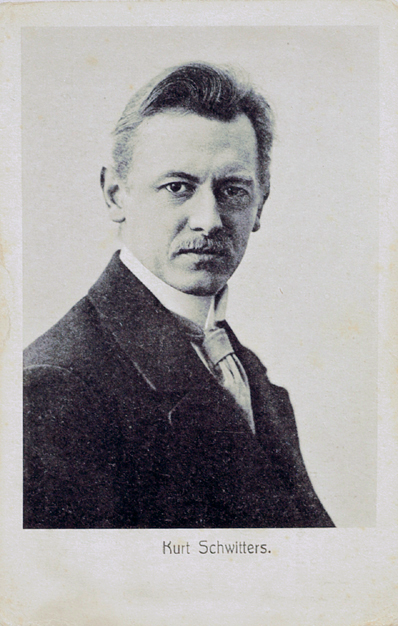 His art is invariably grouped with Dada, although personal clashes prevented him from being admitted formally to membership, and by nature he would never be fully committed to any collective movement, even one of protest: his lack of interest in politics set him apart from the main group of German Dadas, as did his residence in Hanover rather than Berlin. 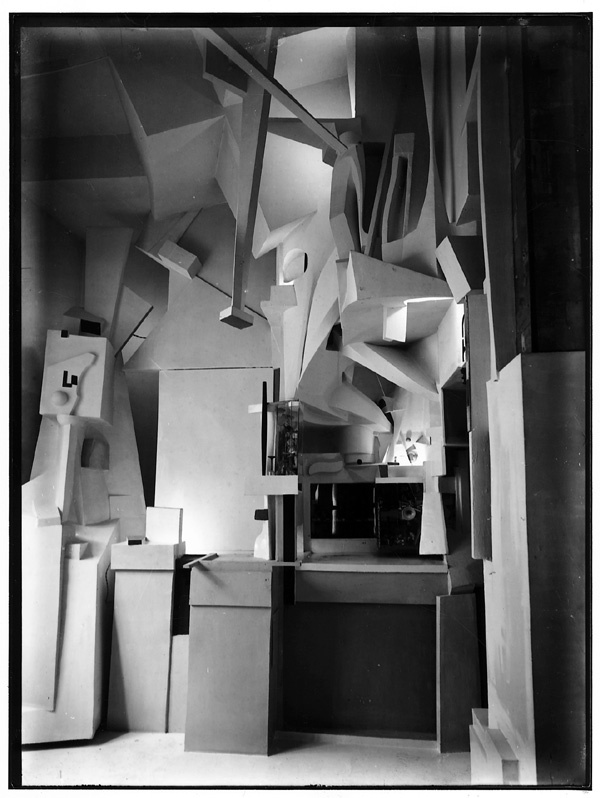 Yet paradoxically Schwitters was intrinsically a Dada: the Dada poet Tristan Tzara wrote that Schwitters was "one of those personalities whose inner structure was always Dada by nature. He would still have been Dada even if the Dada call had not been sounded." By 1918, at the age of 31, he had discovered that he was not at heart a painter, but that for him the essence of art lay in the combination of existing materials. In 1919 he named his personal form of collage "Merz," to signal that his pictures were distinct from Cubism, Expressionism, or even Dada, and over time he extended the name to all his activities, including poetry and performance. Kurt Schwitters, the pioneering German Dadaist now acknowledged as the founder of performance art, was hopelessly misunderstood in his lifetime, at least when it came to the general public. Even before he came to Britain  fleeing Nazi Germany in 1940  his epic sound poem, Ursonate or Ur Sonata, comprised solely of abstract sounds was being pilloried in the national press. The BBC's response in 1947 didn't help. When two reporters turned up to his solo exhibition at London Gallery to record a live performance of Ur Sonata (sometimes translated as "a sonata in primal sounds"), they left halfway through without recording it at all. Only 28 people attended the recital and a fellow artist remembers Schwitters' enduring positivity in the face of an evident lack of interest in the room. 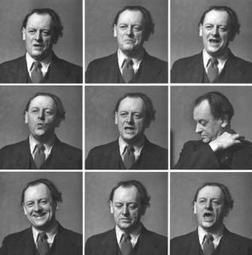 The sound poem, and other works created by Schwitters, have all since been fully reappraised and vindicated. In the past few years, a Schwitters revival has gained ground: Jarvis Cocker played Ur Sonata on BBC Radio 6 Music in June last year; Michael Nyman wrote an opera about the artist in 2003 entitled Man and Boy: Dada; Bryan Ferry is a fan; Damien Hirst owns his sculptures and has spoken of the artist's influence on his own early work. Yet the public is still, by and large, relatively uninformed of the immense imprint left by Schwitters on contemporary British art. Tate Britain hopes to change that by staging a major exhibition, Schwitters in Britain, opening on Wednesday, which will showcase 150 collages, sculptures, paintings and sound poems  some seen in the country for the first time. The exhibition will focus on the years between his arrival in Britain as an "enemy alien" from Germany in 1940 until his death in Cumbria in 1948. 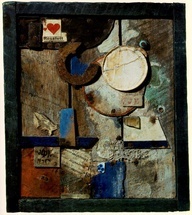 Schwitters developed the concept of "merz" while he was still in Hanover in the 1920s. This was the idea that any object  foraged or found  could be transformed into artistic material if used in the right way by an artist. So a pebble or a piece of corrugated cardboard became as legitimate as oil paint in the construction of an artwork. Emma Chambers, curator of the Tate Britain show, says he referred to string as an analogous line and cotton wool as softness in the formal composition of his work. Kurt Schwitters fled Germany following Hitler's persecution of "degenerate" artists, and spent the last years of his life in Ambleside, Cumbria. The steps of the Bridge House was one of the places he used to display his paintings. He is now the subject of an exhibition at the Tate Britain. In October 1945 the German artist Kurt Schwitters, who had been living in Britain since 1940, wrote a fairytale about a man with a glass nose. At first the man's nose is covered with skin and looks much like a normal nose, but the skin gradually becomes thinner and eventually vanishes completely. What it reveals is quite the work of art: the nose "could reflect the most improbable lights and colours and allowed objects to shine through in fragments". Soon, everyone wants to have a glass nose. Unfortunately, such noses also have a downside: they allow you to smell people's true thoughts, and those who compliment him most smell the worst. Don't listen to people, seems to be the moral of the story. Or in the words of Schwitters's anti-Pinocchio to his flatterers: "You smell of cheese!" Schwitters had had it with the London art scene, and with the English national character more generally. His letters to friends and relatives back in Germany are less coded than his creative output: "You always talk very quietly in England, at least the middle classes do. If you talk loudly you count as 'common', not a gentleman ... The result is a typical English attitude. The English don't defend their ideas, because then they'd have to talk loudly." The years immediately after World War I were filled with great ferment and experimentation. In this climate, poet, artist, and photographer Kurt Schwitters developed his own unique aesthetic, which he called "Merz". The concept was based on assemblage - the combining of ordinary objects with artistic elements. For Schwitters, Merz was an attempt to achieve freedom from all social, political, and cultural fetters. Construction for Noble Ladies is one of Schwitters's large-scale reliefs known as Merzbilder (Merz pictures). It is revolutionary in its incorporation of everyday detritus - a funnel, broken wheels, a flattened metal toy train, and a ticket for shipping a bicycle by train - yet like other Merzbilder, it remains an elegantly composed picture. A traditional portrait of a "noble lady" in profile, turned on her side and facing upward, is also included. These various found materials, seemingly whimsical and casual, are transformed into formal artistic elements by their arrangement according to Cubist principles. Embedded in the composition are hints of a narrative. 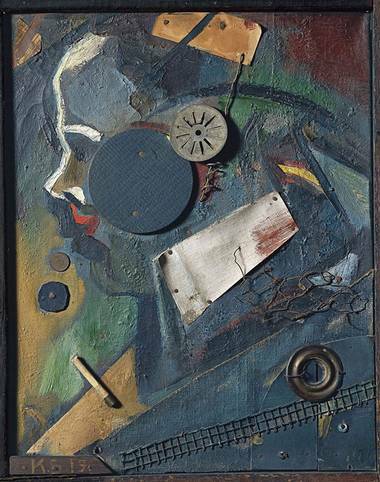 Artist of the moment..Kurt Schwitters.. They were artists without honour in their own land. Derided and abused, Germany's Modernists suffered public scorn and ridicule because their idea of art did not fit with Adolf Hitler's manic hatred of anything considered un-Aryan. Branded "degenerate artists", their work was paraded for the Third Reich's censure and they were banned from producing similar, or in some cases any, work at all. Now, at last, a campaign is to be launched to raise money for the world's first memorial to the artists driven into exile by the Nazis. However, the permanent tribute, costing around £30,000, will not be sited in Germany but in a secluded glade, near a dilapidated barn, in an isolated valley in the Lake District. The barn was the last workplace of the most revered of the refugee artists, Kurt Schwitters, widely considered a titan of 20th-century art, comparable in influence with Pablo Picasso and the radical French artist Marcel Duchamp. Schwitters invented the art form known as Merz (the art of everything). He pioneered collage, was an innovative graphic artist and typographer, performance artist and poet, as well as landscape and portrait painter. His use of recycled debris in his collage and sculptural installations was particularly antagonistic to the Nazis, with their championing of traditional art forms. Along with other "degenerates" his work featured in mock exhibitions staged by the Nazis. He fled Germany, first to Norway and then, when Hitler invaded, caught the last fishing boat out of Scandinavia, survived a torpedo attack and landed in Scotland. Like other "degenerate" artists, he became part of the movement that spread Modernism throughout the Western world. He died in 1948. The Lakeland memorial will comprise a glass top over the treated, upturned complex root structure of a fallen tree. Jill Rock, the artist who will produce the work, plans to call it "Roots of Modernism". Ian Hunter of Littoral Arts, which owns the Cylinders Estate where Schwitters produced his work, in what he called the Merz Barn, near Great Langdale, and where the monument will be sited, said: "As far as we know, there is no formal memorial or designated public place in which to honour or remember all the artists who were interned, executed, or forced to flee their homes and studios." The Littoral Arts Trust, which looks after the barn and sponsors the project, aims to raise £30,000 by next April. Volunteers are being sought to help with the memorial, and other work proposed at the site. 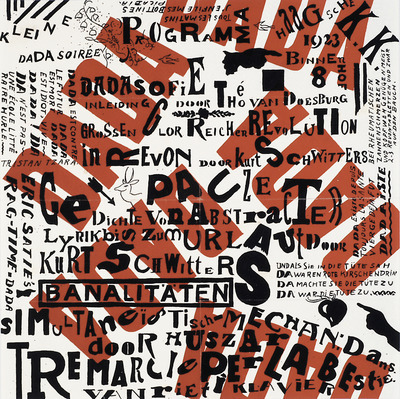 In Hanover, the Dada spirit was embodied by a single man, Kurt Schwitters, trained under the sign of expressionnism but who, as early as 1918, had renounced figurative games to create a highly personal plastic grammar, substituting all kinds of rubbish found in public garbage dumps for noble pigments. All these cast off materials were transformed by him into admirable compositions in which colours and volumes made mysterious alliances. He called these strange paintings Merzbilder (after the central syllable of Kommerzbank) and named them by numbers in chronological order of their composition. 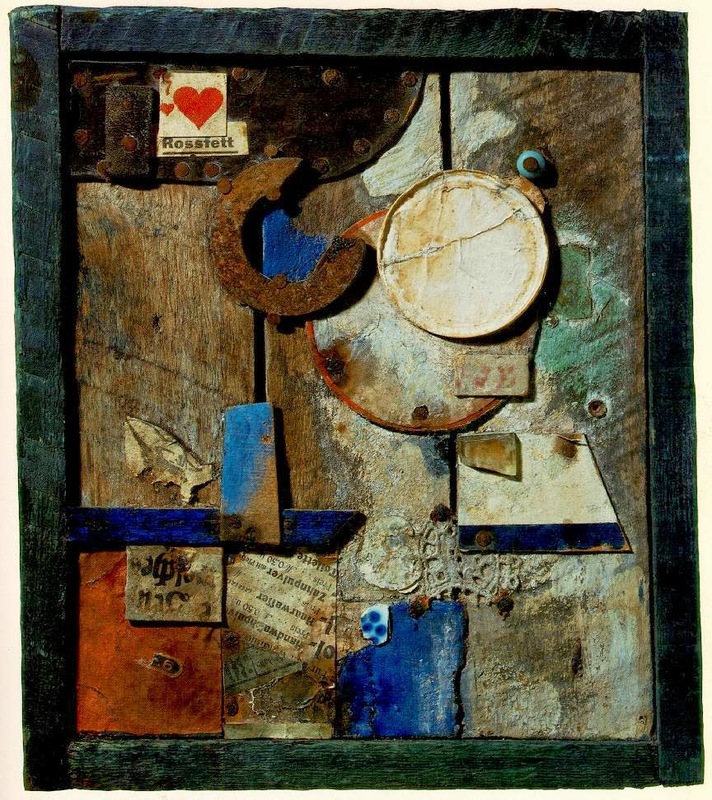 Schwitters is the forgotten modernist. Afforded only a paragraph in many tomes and sometimes missing entirely from the chronologies that direct art-history students in a line from Impressionism to the present, the German-born Dadaist should be more than an obscurity who is perpetually rediscovered. Indeed, as a pioneer of installation art who sought to collapse the walls between painting, sculpture and the everyday detritus of a consumer society, Schwitters (June 20, 1887- January 8, 1948) has perhaps never been so vital to contemporary trends as he is today. 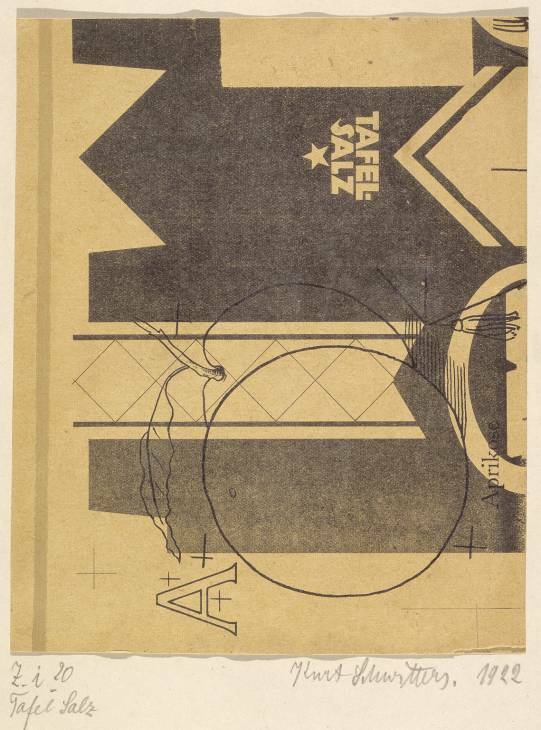 A poster designed by Kurt Schwitters and Theo van Doesburg for the "Kleine Dada Soirée," an uproarious Dada performance held in The Hague in 1922. New York, MOMA. Merz [No.] 4. Banalitäten. Juli 1923. Redaktion des Merzverlages: Kurt Schwitters. (16) pp. (paginated 33-48). 9 line-drawn and halftone illus. Contents printed on pink stock. Lrg. 8vo. Orig. 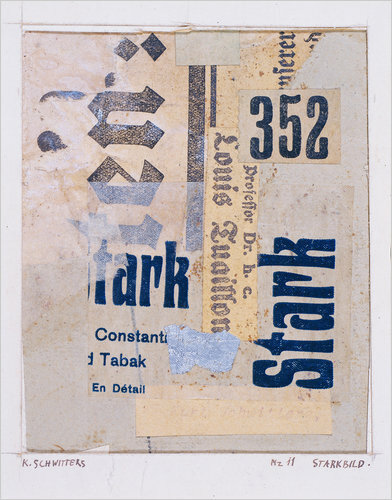 wraps., with typographic composition by Schwitters. Contents printed on pink stock. 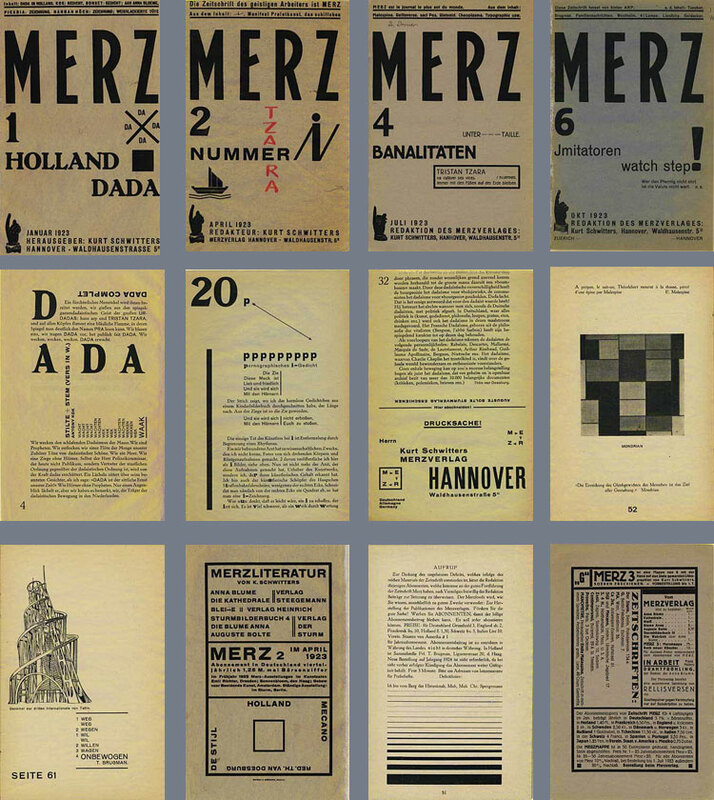 Containing Schwitters' "Banalitäten," Arp's "Die Hausernkaserne," Hausmann's "Chaoplasma," and other texts and verse by Ribemont-Dessaignes, Tzara, Malespine and others. Illustrations by and after Picasso ("Sacipos"), Rietveld, Schwitters, Oud and Van Doesburg, Segal, Arp, Moholy-Nagy, et al. The Hatton Gallery is home to the Merzbarn Wall. Constructed in a barn in the Lake District during 1947-48, and transported to the Hatton in 1965, the Merzbarn was Kurt Schwitters' final, and in his own estimation, 'greatest', piece of work. This wall forms part of the third and last Merzbau (or sculptural installation), constructed by the celebrated collagist Kurt Schwitters in his Lake District barn. It is now on permanent display in Newcastle University's Hatton Gallery. Exceptional performance of the Ursonate that can be read at the same time! A comparison of the two recordings is recommended. Blonk is incredible. Article about Jaap Blonk's performance of the Ursonate in Houston, Kurt Schwitters, Dada and Marcel Duchamp. This article contains his performance of the Ursonate. TUCKED away in a little university art gallery in the north-east of England (the Hatton Gallery at Newcastle-upon-Tyne) is one of the least known masterpieces of 20th century art, the Merzbarn relief. A merz can roughly be described as a "psychological collage", which contains fragments of found objects, some with autobiographical elements. 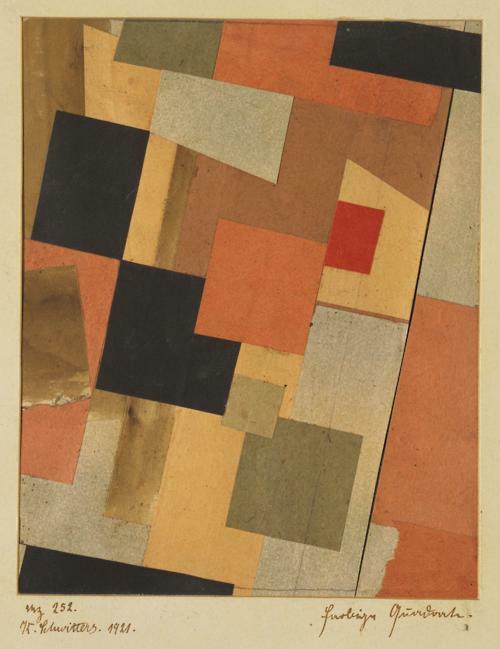 Kurt Schwitters: Coloured Squares (1921)..